These Adorable & Healthy Pups (2 boys & 2 girls) are Nearing 30 days Old. 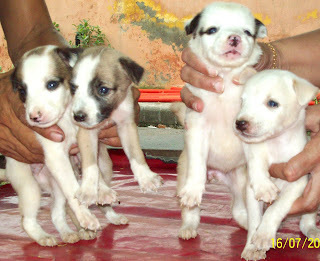 Their Mother is a White Spitz and Father an Indian Breed. They are currently with their mother & are being well looked-after. To Adopt these Darlings, call at 9810560230 or 9971984151. We adopted one of the pup and she is a real joy to us. We have named her 'tofu':). I really urge people to adopt Indian dog and pup and share a life filled with unconditional love. And hats off to these wonderful people of Angel eye who have taken this nobel pledge.